I heard the neck width was skinny? True or no? It is a little skinnier than a Strat neck, more like a Tele neck I think? I like it though. It plays fast! "It's not apathy...I just don't care"
My sunburst should be delivered today. I'll post a review after I put it through the paces. Hopefully the neck won't be too skinny. I got my Blonde 51 for a steal....Guy sold it to me used, in perfect shape, for $115.00 with a hardshell fender case. He had upgraded the tuners to vintage Klusons. Since then, I have bought a tortise pickgaurd from Pickguardian.com (tony is great to deal with) $60. And I just replaced the neck pup with a Seymour Duncan SSL-1 Vintage Staggered. Sounds great and looks cool too. It has to be one of the best guitars I have ever bought for under $350. Sunburst in the house...After all this I had to get one too.. "but honey it has a HUMBUCKER..." Took a couple of old SS amps over to the local GC this morning;came away with the '51, a nice gig bag, and 5 packs of D'Addario 10's !!! Killer guitar, great tone and much better F&F that my Custom II from last year. Most of you know about my Lipstick Blonde (in Tweed). She will play her first gig May 13. Count me in. I've got a blonde and a sunburst! The sunburst has a Rio Grande Muy Grande in the neck. Overall, I like these guitars very much. The blonde never gets played, I might trade it for a Squire Tele, but the sunburst is here to stay! Very playable, very functional. New pickups can be a real benefit, but for $150 I don't think it can be beat! What color are the pickguards that ship with the blondes? I know they show black ones on the Squier site, but seems like some folks said they got white ones. i have read some ppl got the 2005 model with a black gaurd, in know they started with black and then wwent to white on the 2004 versions, this leads me to believe they have gone back to black, but that is just a guess..with all the complaints on the white guards i wouldnt be suprised if thy went back. I have also joined the club, picked up a blond one with black guard. I have seen two Squier 51 live here in Stockholm Sweden and both where blond with black guard, see the link http://www.jam.se/images/squier51.jpg. you might try the coil tap, or think about changing the bridge pup, still I have to say that most people that changed theirs went back to the originals..I have had mine for a good 10 months now, and recently picked up a sunburst to give blackie company. Have fun! My '51 arrived on Nov. 4th. I took it out of the box, played it for a minute, and then went to vote. My horse lost the race that day, but I came away with a great guitar. Even though the neck is thin I still love it. 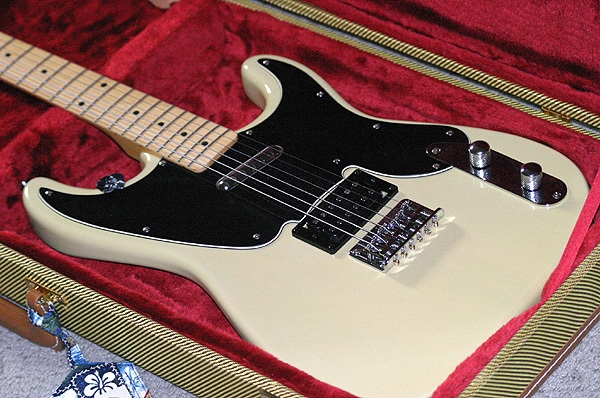 I seriously debated ordering a blonde '51 to compliment it, but ordered a Squire HH satin strat instead. Just got it the other day and it's really cool, too. that is the coolest modded 51 i have ever seen, just awesome...no i have to have one..how much is the 60's reissue neck running? and did you get the black guard from pickguardian.com??? Johnyd, did the strat neck fit without any problems? I thought the squier necks were narrower at the heel? Looks great! Thanks guys. The neck was a perfect fit. They're going for roughly $150-$200. Kinda crazy for a $150 guitar I know but I it feels great (I prefer the 60's necks) The pickguard is from pickguardian. I think I was one of the first to get a 51 guard from him. I'm glad to see so many people interested in replacement guards because Tony is a great guy to deal with. I picke up a '51 a few days ago, and along with my FM25... finaly a budget guitar & amp that make sense two DIFFERENT PU's with some useful ways of blending them, light, and stays intune..a amp that you can carry , but is loud enough to play with some folks. and the pair cost about what the average amateur muso would spend on a Trumpet, acoustic guitar, Keyboard ect. The '51 a sure cure for GAS! I'm still excited about mine. Sounds great through my Vox AD50VT! Something I'd like is a good tremolo bridge put on it. Would this be hard to do? I imagine I'd have to a tech do it if it requires taking chunks of wood out. It would be the perfect Frankenstrat! Add me to the list of 51 sunburst owners.I like the neck profile and finish. Lot's of bang for only a buck and a quarter.